Like most people my first exposure to Danny MacAskill was in 2009 on YouTube in watching him trying to ride his bike across the top of a wrought iron fence. After a few unsuccessful attempts he finally makes it. 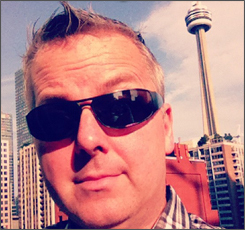 That first video shot by his roommate has been viewed over 31 million times on YouTube. Since then MacAskill has gone on to showcase his mind-blowing cycling-control skills in videos such as ‘Way Back Home‘; a series of stunt recorded in Edinburgh and around his hometown in the Isle of Skye, ‘Industrial Revolutions, shot for Channel 4’s documentary Concrete Circus, and a Leica-sponsored clip where he takes on the streets of Cape Town, South Africa. 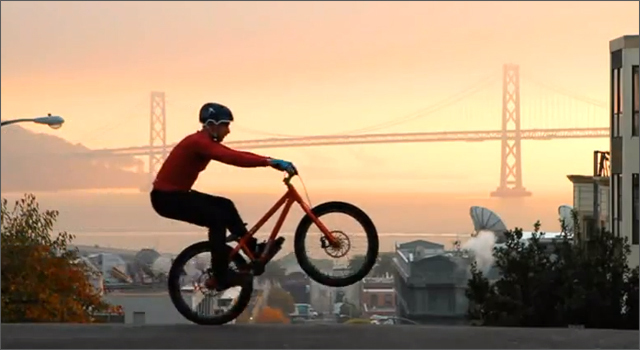 Now, MacAskill takes on the streets, sidewalks and parks of San Francisco in a clip sponsored by Remington Europe. The video is part of a series by Remington that stresses precision and control, other videos in the series include McLaren Mercedes test driver Gary Paffett, freeriding snowboarder Johno Verity, and parkour originator David Belle. 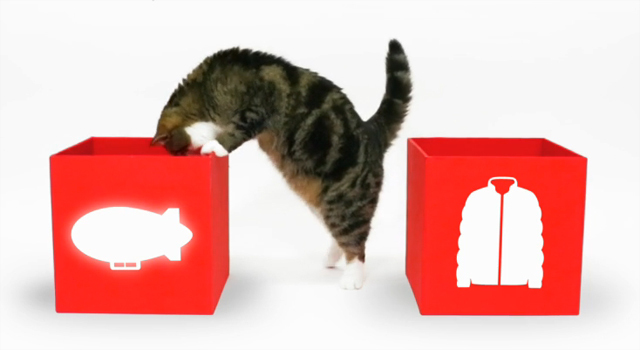 Japanese fashion brand UNIQLO has teamed up with YouTube-famous feline Maru for ‘Lucky Cube‘, in a promotion for the October opening of their new San Francisco store. Maru, a five year old Norwegian fold, is the star of his own YouTube channel with over 174 million views. If you love watching a large cat jumping into boxes or paper bags, this is the channel for you. Maru’s skill at jumping into boxes is the basis of the ‘Lucky Cube’ contest. Each box contains a prize code which can be redeemed at a UNIQLO pop-up store in September or at the store after it opens in October. Prizes include 50 blimp rides, 100 ultra-light down jackets, and 1000 heat tech long sleeve crew neck shirts. 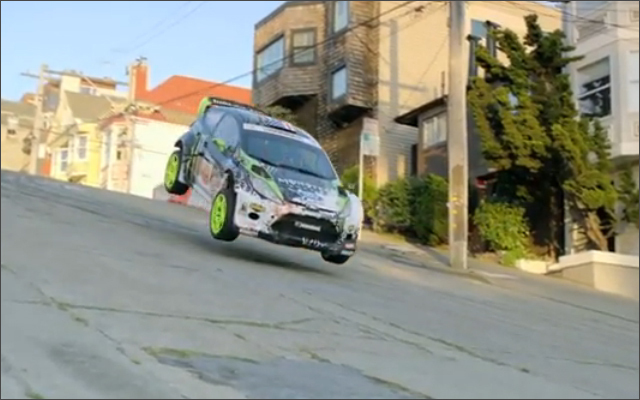 In 2012 Monster Energy rally team member (and DC Shoes co-founder) Ken Block gets his chance at tearing up those same streets of San Francisco is Gymkhana 5. Gymkhana is a timed auto racing event involving a complex course involving reversals, 180 degree spins, 360 degree spins, figure 8s and other advanced driving skills. The video was shot over four days by director Ben Conrad and his team and shows Block screaming through and over such iconic San Francisco landmarks as the Bay Bridge, trolley cars and the waterfront warehouses in his 650 horsepower Ford Fiesta. I’d love to see someone put together a custom Google Maps showing the various areas that the video was . 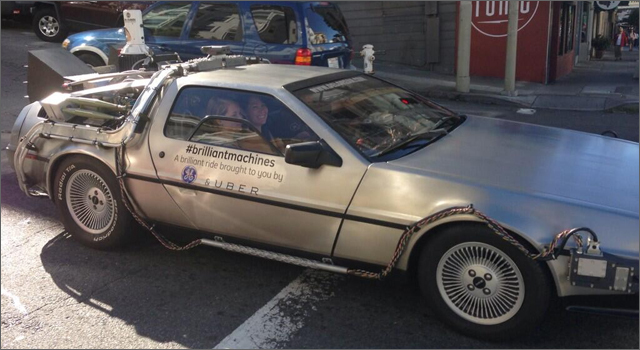 It’s great product exposure for Monster, DC Shoes, Ford and the streets of San Francisco. San Franciscans passing by Justin Herman Plaza on May 17 stumbled across a 14-foot-tall, 10 foot-wide vending machine that appeared overnight. No, it wasn’t another magical Coke machine. 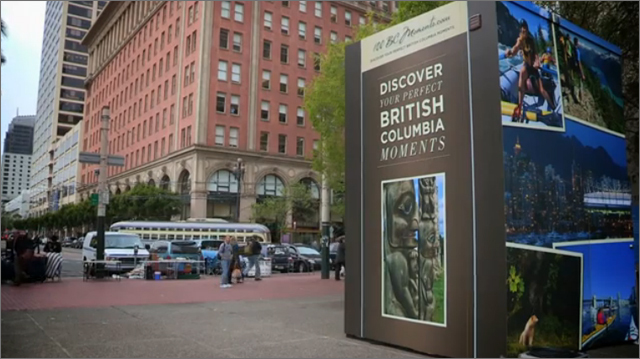 This was the BC Moments Machine, a promotion for Tourism British Columbia and the 100BCMoments website encouraging people to consider a visit to BC this summer. Throughout the day the BC Moments Machine ‘dispensed’ such exciting items as mountain bikes, kayaks and BC-made surfboards. The experiential campaign was created by Citizen Optimum, with the vending machine produced by The Media Merchants. A few weeks ago eBay introduced their a new mobile app with ‘The Inspiration Shop’, an interactive window shopping experience curated by artist and interior designer Jonathan Adler. Passersby could scan the QR codes associated with each of the displayed items to be directed to the eBay mobile listing where the items could be purchased. The same mobile app is being used by eBay to power the ‘Give-A-Toy‘ Holiday campaign for Toys for Tots. Interactive store windows in New York and San Francisco feature a lively environment of animated toy trains, teddy bears, robots and more. 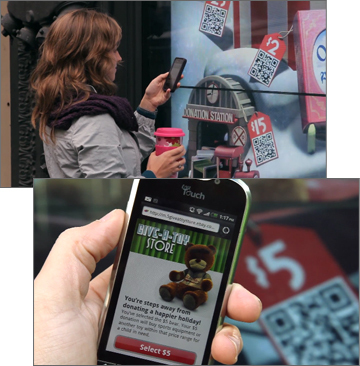 Visitors can interact with the display, changing it from dark to night or making it snow and ultimately make their donation by scanning the QR codes displayed on the screen. For the people not in New York or San Francisco who would like to donate, they can visit ebay.com/giveatoystore to make their donation. EBay’s Facebook fans can personalize one of the toys from the interactive window and share with their friends. For every completed toy, eBay will donate $1 to Toys for Tots (up to $50,000) and a chance to enter a sweepstakes to win a $1000 shopping spree on eBay.